Photograph of the fovea centralis of the retina. Journal : Transactions of the American ophthalmological society ; vol. iii. New York : American Ophthalmological Society, 1880. Description : p. 174, [1 l.] pl. ; ill.: 1 phot. ; 24 cm. Photographer : Prof. J[ohn] W[illiam] S[chmidt] Arnold (1846�88). Subject : Fovea centralis — Photomicrography. Author caption: By Dr. O. F. Wadsworth, Boston, Mass. Interned, Mass. General Hospital, Boston, 1865. Asst. Surgeon, Fifth Massachusetts Cavalry, 1865. Post graduate studies, Zurich, 1869. Ophthalmic surgeon, Boston City Hospital, 1870. Ophthalmic surgeon (out-patients), Mass. General Hospital, 1874. 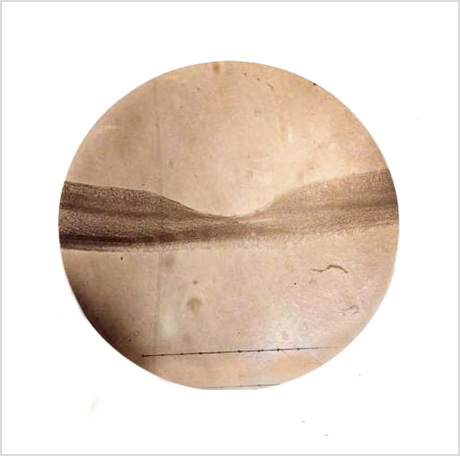 The photomicrograph is the work of John William Schmidt Arnold (1846�88), who took his medical training at Bellevue Hospital Medical College within the physiological laboratory of Austin Flint, Jr., (1836�15). He earned his medical degree in 1871, and rose to fill the chair of physiology and hygiene, vacated by Draper at the Medical College of New York University. The college designated him Emeritus Professor in 1882, but Arnold suffered from chronic asthma his entire life and he was forced to resign his position for health reasons.